The sleek and stylish LG K4 features a 4.5 inch IPS LCD capacitive touchscreen with a resolution of 480 x 854 pixels and a pixel density of 218ppi. Colours appear vivid, making gaming and watching videos a pleasurable experience. 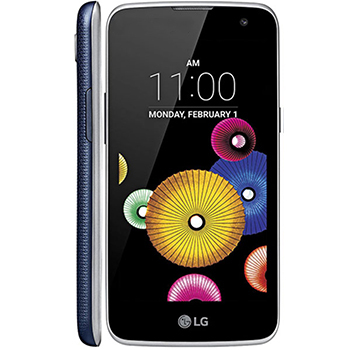 The LG K4 features a 5 megapixel main camera letting you take and share great shots with family and friends. The rear camera features autofocus and LED flash. Capture perfect selfies every time with the front facing 2 megapixel camera, simply raise your hand, align it in the box and make a fist to commence the 3 second timer. Even at night time you can still achieve the perfect selfie with a screen that puts a bright white border around the photo preview. The compact LG K4 measures 131.9 x 66.7 x 8.9mm and has gentle curves, a metallic frame and textured back giving the device a premium feel. This great looking device weighs in at 120grams and is available in black/white or white/white. The LG K4 is available with 8GB of storage and 1GB RAM. Running Android 5.1 Lollipop, the device comes with a 1.0 GHz quad-core processor. There’s a removable 1940mAh battery on board giving up to 9 hours of talk time and 500 hours standby. 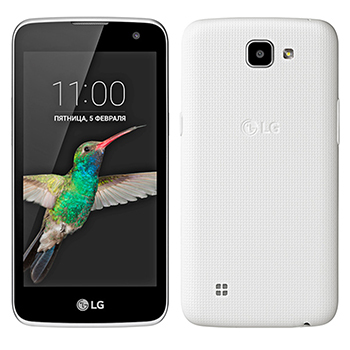 The device comes with 4G LTE, dual-sim capability, Bluetooth v4.1 and Wi-Fi.